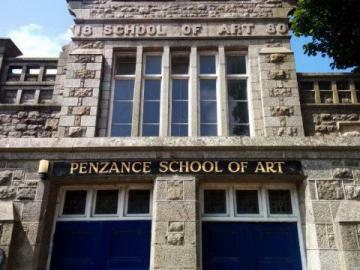 The Penzance School of Art in Morrab Road is situated in a classic granite building featuring purpose-built studio space with fine overhead lighting and ceramics facilities, and offers adult-education art courses. The building sits at the top of Morrab Road in the centre of Penzance, at the edge of the spacious Penlee Park. Penlee Park is also home to Cornwall's well-known Penlee Museum in Penlee House with its extensive collection of Newlyn School paintings, local historical artefacts, and sunny terrace cafe. Adult Education art classes are currently offered here by Truro and Penwith College, which is made up of Truro sixth form college and the former Penwith College. Art and craft classes offered include painting, drawing, figure, landscape, pastels, pottery and crafts, while independent life drawing classes are available from the life drawing in Penzance group close by. The premises are also used for Foundation and HND courses offered by the college, and occasional short courses and student exhibitions. 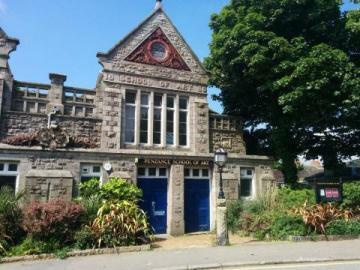 One section of the Penzance art school building previously housed the Penzance Public Library, which in 2016 moved to the enormous St John's Hall about 100 yards away, along with various other public services, taking the place of the now deceased and buried Cornwall Geological Museum. St John's Hall is by all accounts the largest granite building in the country, and its central hall is extensively used for events, exhibitions, meetings and performances. The Penzance School of Art was founded in 1853 by Henry Geoffroi of France, providing the first art school west of the city of Bristol. In the pre-photography era drawing and painting skills were essential for recording visual data, with watercolour painting also an essential skill of a military officer to record reconaissance observations, and flower painting an essential skill of the cultured lady to pass the time. 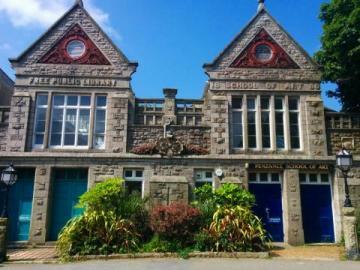 The success of Geoffroi's Penzance classes led to the construction of the current premises, which opened in 1881 and today has Grade II Listed Building status. The grand purpose-built building was proudly paid for at the time by public subscription, the contemporary equivalent of crowdfunding. In fact Penlee Park itself was also acquired for the town by public subscription in 1946, showing a spirit of generosity and commitment to public provision. One well-known lecturer at the Penzance Art School was the renowned painter Stanhope Forbes, and in 1899 he founded the now famous Newlyn Art School together with his wife, the Canadian painter Elisabeth Armstrong whose work is known under the name Elisabeth Forbes. The term "Newlyn School" also describes a style, or colony, of painters of the era before WWI who were attracted to the fine light of West Cornwall. They were influenced by Impressionism and favoured outdoor painting with free brushwork, often taking as subject matter the fisherfolk of the local fishing port of Newlyn, finding both inspiration and desperation in the dangerous lives of those fishing families taking the lives of fish and being taken by the sea. Newlyn is a functioning fishing port to this day, involved in killing millions of fish and pushing some close to extinction. In the current century the Newlyn School of Art name was recycled to launch a Cornwall art school business in 2011 in a disused primary school on a steep hill in Newlyn, offering upmarket leisure courses and holiday courses to adults in many traditional artists' skills and disciplines such as drawing, painting, printmaking and portraiture.